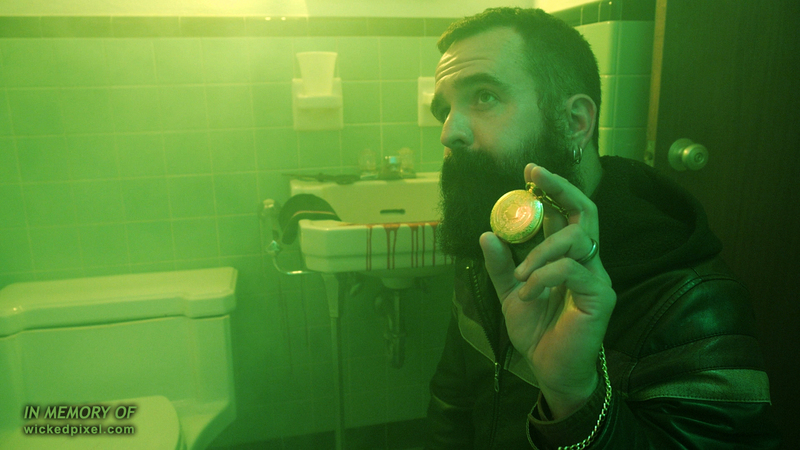 Eminent horror journalist Heather Wixson interviews director/co-writer Eric Stanze about the writing and production of IN MEMORY OF. Read the interview here! A fever-dream horror road-trip adventure film, IN MEMORY OF is now available on Blu-ray, a two-disc release that includes a 93 minute making-of documentary. Details on the new Two-Disc Blu-ray release of IN MEMORY OF are here! 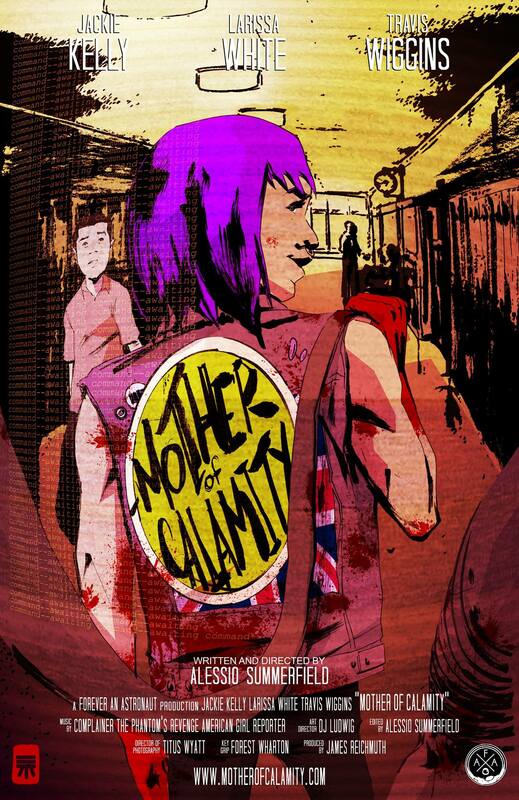 Shot in Illinois, Missouri, Oklahoma, Texas, New Mexico, Arizona, and Utah, IN MEMORY OF is a sprawling journey through madness that stars Jackie Kelly in her feature film debut. IN MEMORY OF also stars Jason Christ (RATLINE), Adam Ahlbrandt (director of CROSS BEARER and THE CEMETERY), Emily Haack (SCRAPBOOK), DJ Vivona (ICE FROM THE SUN), Haley Jay Madison (HEADLESS), Jason Allen Wolfe (DEADWOOD PARK, BAD GRANDMAS), and Katie Groshong (A MEASURE OF THE SIN, JUG FACE). Click here to read Daily Dead’s interview with Jason Christ, co-writer and one of the stars of IN MEMORY OF! Details on the Two-Disc Blu-ray release of IN MEMORY OF can be unearthed here. Jim Ousley is not only one of the stars of our newest film, IN MEMORY OF, he is also the writer of “The Dead Palace” – a ghoulish graphic novel which shall materialize for the very first time at “The Dead Palace Meet ‘N’ Creep”! 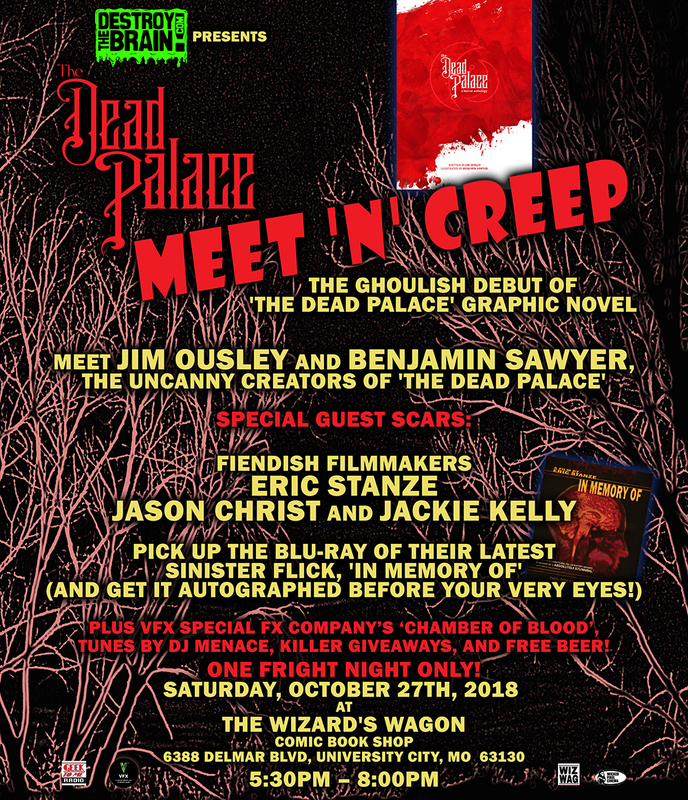 It’s a Halloween party to celebrate the release of “The Dead Palace” and give you the opportunity to Meet ‘N’ Creep with the creators of this new horror comic book, Jim Ousley and Benjamin Sawyer! Also appearing in the flesh: filmmaker Eric Stanze and the stars of IN MEMORY OF, Jackie Kelly and Jason Christ. The Two-Disc Blu-ray release of IN MEMORY OF will be available for purchase, so you can rip that shrinkwrap right off and get that Blu signed by the film’s director and cast! This spooktacular Halloween event takes place October 27th, 2018 at The Wizard’s Wagon comic book shop, 6388 Delmar Blvd. University City, Missouri 63130. 5:30pm to 8pm. Order “The Dead Palace” here and pick it up at the Meet ‘N’ Creep event 10/27! IN MEMORY OF details and preview trailer are gathered here.